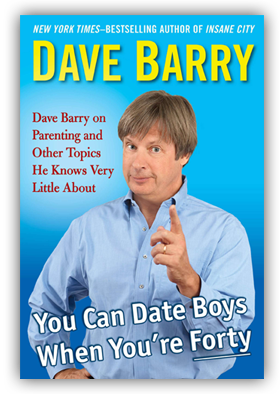 The subject of this book review is Dave Barry’s new book of essays entitled, “You Can Date Boys When You’re Forty: Dave Barry on Parenting and Other Topics He Knows Very Little About”. This is a moving collection of essays in which Mr. Barry bravely recounts, with moving prose, the many battles he has faced in his advancing years. While the topics of these essays range from rediscovering youth in the face of getting older (Sophie, Stella and the Bieber Plan) to accepting the physical limitations that come with aging (Manliness & What Women Want) to overcoming fears that arise when a person has one foot in the grave (“Grammer”) for me, the most moving essays were Seeking WiFi in the Holy Land and How to Become a Professional Writer. In Seeking WiFi in the Holy Land, Mr. Barry recounts a harrowing tale wherein he found himself lost in the Middle East deserts surrounded by Bedouin camels and descending down sheer cliff faces in a desperate attempt to reconnect with his family. In brief, Mr. Barry found himself in this situation while en route to Lebanon, Texas when he mistakenly boarded a plane to the country of Lebanon. After a brief detainment in Beirut, he was left alone in this strange country without a way to contact his loved ones in the United States. Alone and afraid, Mr. Barry began his journey that ultimately covered more than 130 miles as he trekked through the desert wastes of Lebanon and Israel before stumbling into Tel Aviv in an even less coherent state than he was when this unfortunate journey began. At the risk of giving away too much more of this essay, I am going to share with you a couple of lines that moved me to tears when first I read them. As if Seeking WiFi in the Holy Land wasn’t enough of an emotional read, Mr. Barry tops himself with an essay called How to Become a Professional Author. This essay provides an introspective look back on his career when, at varying times, he struggled as a writer (“It takes determination and a lot of plain old hard work.”), battled various addictions (“There is basically nothing in my kitchen that I have not, at one time or another, smeared peanut butter on”) and, sometimes, both at the same time (“The downside to the children’s book genre is that— this is well known inside the publishing industry— it’s impossible to keep cranking out this kind of crap without turning to hard drugs.”). This essay serves as both an inspiration and a warning to those who are thinking about trying to break into the writing business all while being told with Mr. Barry’s patented sad, yet honest, humor. 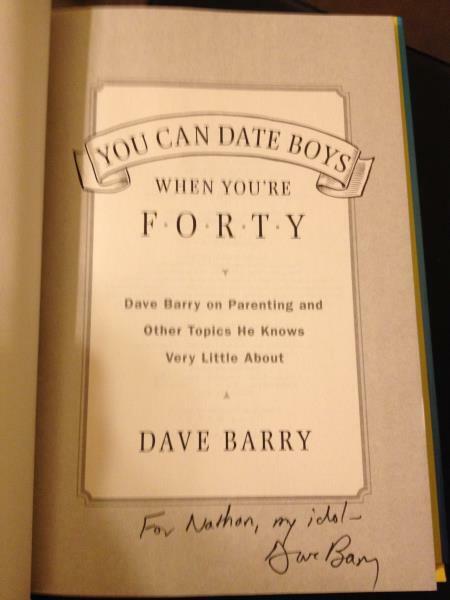 Needless to say, Dave Barry’s “You Can Date Boys When You’re Forty: Dave Barry on Parenting and Other Topics He Knows Very Little About” is a book that I will cherish for the rest of my life and will surely touch the lives of people all across the world. Whether you are advancing in age, have mistakenly flown to a foreign country, or have struggled with many of life’s big issues, such as: peanut butter addiction, grammar, death or manliness you will undoubtedly find inspiration in the courageous and dignified example that Mr. Barry has set forth in this book. Source of Quotes: Barry, Dave (2014-03-04). You Can Date Boys When You’re Forty: Dave Barry on Parenting and Other Topics He Knows Very Little About Penguin Group US. Kindle Edition. A youthful looking Dave Barry and a bearded looking me. 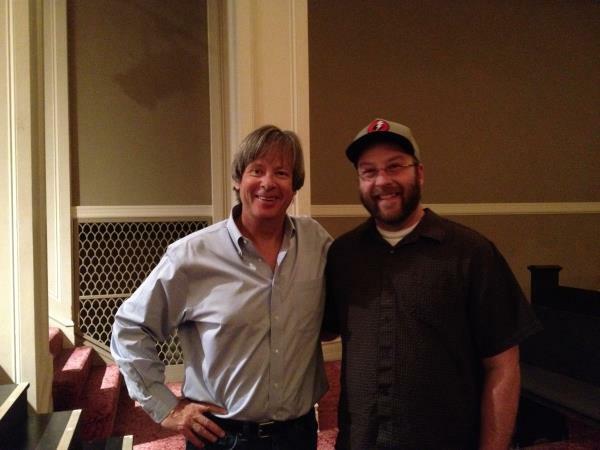 Proof that Dave Barry’s mental faculties are not as youthful as his appearance.